Description: If you’re like a typical homeowner, you probably have some items in your home that you really want to secure. These may be jewelry, including the Rolex you inherited from your grandpa. These may be items that you don’t want your kids to fiddle with, such as your firearms. Other items you may want to protect include sentimental photographs, important documents like your birth certificate, and digital media like DVDs and USBs containing crucial files and videos. All these are items that can drive you to carefully check out every best home safe reviews to help you secure these things. Have you ever experienced the extreme frustration of the red tape you need to go through to get a new copy of an official document like your birth certificate? It’s enough to make you swear to yourself that you’ll take better care of these documents next time. That’s a job for a very affordable yet quite sufficient home safe for documents like the Sentry Safe HD4100. This is basically a small box that you can lock and open with a key. It won’t keep your items safe from thieves, but then the function of the safe is to just keep the documents safe from fire and water damage. Here you can put in your official documents, medical records, financial papers, and even digital media. It comes with a privacy key lock to keep other people from going through your official papers easily. Its interior size is 0.65 cubic feet, and its dimensions make it suitable for holding up to 40 standard hanging folders measuring 8.5 by 11 inches. The lid has an organizer where you can put in your medial files, extra keys, and passports. The safe has been verified by 3rd party inspectors to protect electronic storage devices, including smartphones and tablets, external hard drives and USB drives, along with DVDs and CDs. The fire protection is rated to protect your safe contents for half an hour with a fire reaching up to 1550 degrees F. This has been verified by the independent Underwriters Laboratory (UL). If you do have a fire in your home with the Sentry Safe HD4100 protecting your documents, the safe will be replaced. The water damage protection has also been 3rd-party-verified to keep your papers from water damage for up to 72 hours. This weighs only 39 pounds. The fire protection is adequate. The water resistance is terrific. The dimensions make it very suitable for documents. It can accommodate other small items like handheld electronic and storage devices, with built-in straps. A determined thief can destroy the lock quickly. A thief can also just carry the entire safe out of your home. If you’re just worried about your documents, then this is a fine option. After all, who would care enough to steal your birth certificate and passport? Just label it as official papers, and thieves may ignore it. Just remember that this is not a safe you’d use to protect valuable jewelry. It’s too flimsy for that. However, this will protect your documents from a home fire, flooding, or even insect or rodent damage. Buy it cheap, and then file and forget about your papers. They’re as safe as they can reasonably be. It somehow seems a bit safer for a safe if it isn’t easily found by thieves or nosy kids. This wall safe fits that description nicely, as it’s designed to be installed on a wall behind a painting or inside a closet. The frame around the front of the safe hides the lines that aren’t cut straight along with the drywall. This comes with predrilled holes with fixing bolts to anchor the safe in place. This is a rather formidable safe, and it uses the solid steel measuring of an inch thick. It’s tough enough to resist even an attack with mechanical tools. The hinges are tamper-proof. It then uses a double lock mechanism, with a simple programmable electronic lock that opens with your PIN number, along with a key lock. The inside measures 20.25″ high and 14.25″ wide, and it is 3.75″ deep. It comes with shelves for more convenient storage of items, and the bottom is covered with gray carpet mat padding. It’s not that heavy at 39 pounds so that you can raise it up or even move it easily enough. It uses an electronic lock as well as a key lock. It’s spacious enough inside to hold a wide variety of items, and the shelves offer conveniently organized contents of the safe. The safe is designed to hide more easily behind a wall picture or inside a closet. The sides of the safe are made of tough solid steel, and even the hinges can deter would-be robbers. It offers a manufacturer’s warranty for 10 years. 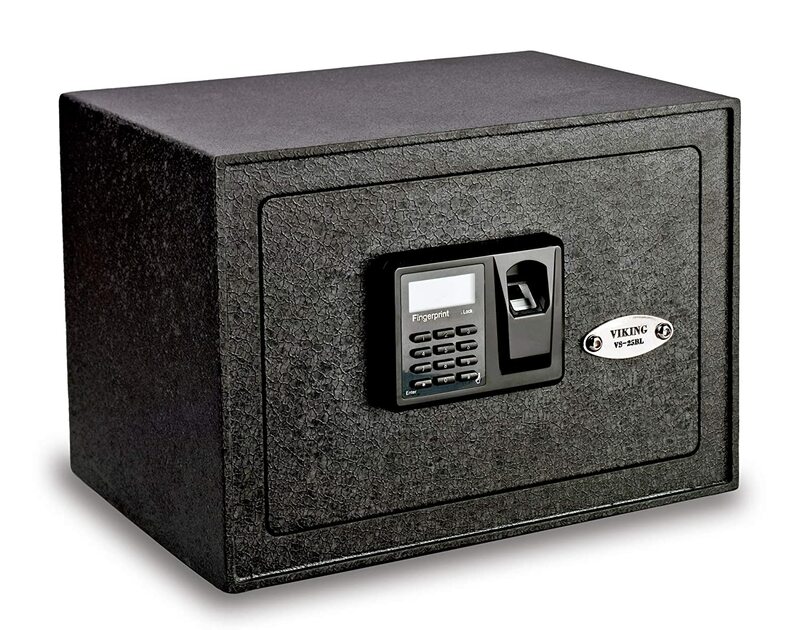 The safe offers several layers of protection against thieves, such as concealment, resistance against tools, and a sophisticated electronic lock. It can protect against hammer and drills. It can protect against water damage simply because it’s raised off the ground. Very easy to install with its predrilled holes and included bolts. For the features you get, it’s very affordable. It’s great for small items such as wristwatches and jewelry, though you may have to put them in without the box. It doesn’t offer much protection against fires. It’s not very deep at less than 4 inches. A determined burglar can still defeat this, though it may take some time. For various items you want to keep away from casual thieves, this can work fine. It may not be enough for your Rolexes, but then for more affordable wristwatches, it should be fine. It’s easy enough to install and use, and easy on your wallet. Meanwhile, it’s not as easy for thieves to get into it, or to even find it in the first place. All in all, it’s a worthwhile investment. What if you forget your PIN or misplace your key? That aren’t problems when it comes to your fingerprints, and so this means that you can always open a safe like this. It’s easy enough to open, and not so easy for thieves. Inside, it measures 9.5″ (250 mm) high and 13.5″ (350 mm) wide, while the compartment is 8.6″ deep. That should be large enough to fit in jewelry and wristwatch boxes, and some even use this as a gun safe. The locking mechanism includes a biometric fingerprint reader along with a digital LCD keypad. This means it can be opened easily enough with your fingerprints and 32 fingerprints can be stored in its memory. It can also be opened by a PIN code or key. The VS-25BL offers several nice extra features too. It can emit a warning beep if it’s left open for more than a minute, but you can turn the sound on and off. There’s a time out period as well if you do 10 incorrect fingerprint attempts or 5 incorrect PINs. The inside surfaces are carpeted and there’s an LED light. This isn’t waterproof or fire-resistant, though the steel body may keep the contents from being damaged if the firefighters get to your burning home soon enough. This can be installed on your wall, so this placement can protect it from flooding damage. The locking mechanisms include a fingerprint reader, a PIN code electronic lock, and a key lock to close a motorized deadbolt locking mechanism with pry-resistant slots. The steel panels are laser cut and seamlessly welded. There’s a timeout feature if you make enough incorrect attempts to open the safe. It has an LED light inside with carpeted surfaces. The safe beeps a warning if you leave it open for a minute. Comes with pre-drilled holes and included anchor bolts. It only weighs 27 pounds. It can work as a gun safe with its dimensions. It offers great protection against thieves. It doesn’t take too much time to open with your fingerprint. It has a backup PIN system plus backup keys. The shelf inside is adjustable, and you have light and carpeted surfaces for your items. It has a military scratch-resistant finish. There’s no real fire protection aside from the steel sides. It’s not waterproof either, but then it’s a wall safe so it’s not really vulnerable to flood damage. The dimensions and security measures make it an ideal handgun safe for many households. It’s able to let you open it quickly, and at the same time, it can frustrate many would-be thieves. With its simple installation measures, you should be able to put this inside your bedroom so that you can get to your guns quickly if there’s an intruder during the night. This is another one from Sentry Safe, but this time the X105 is larger so that you’re able to protect more than just mere documents. 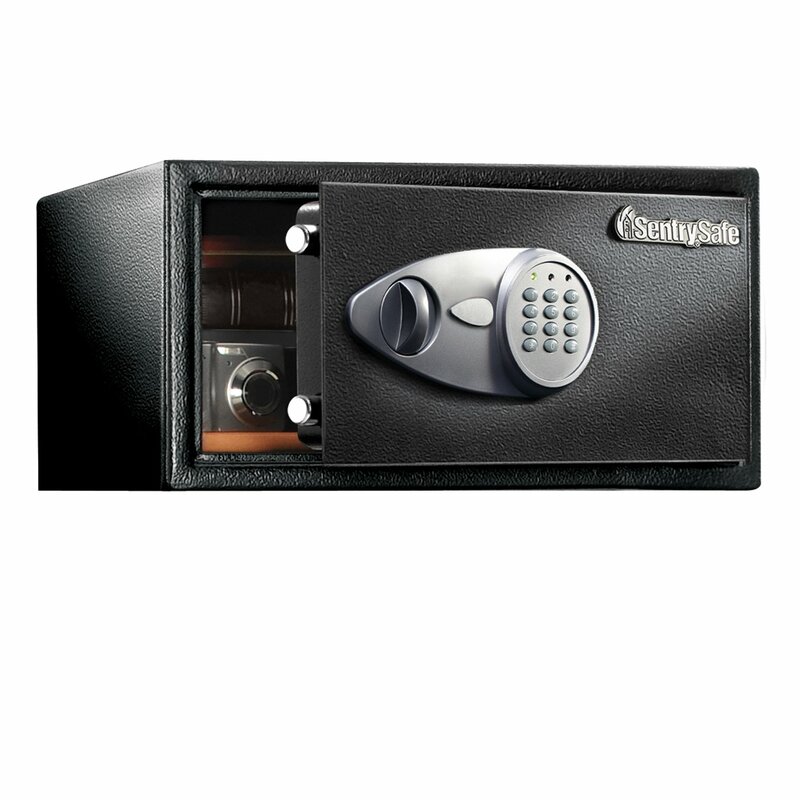 This time, this safe is meant to protect your valuables, such as rings and expensive wristwatches, and its features demonstrate why it’s great for this function. This comes with a programmable lock so you can open it with the number combination you memorize. The lock also uses 2 live-locking bolts. You do have an override key in case you forget your number or your battery runs out, so you can always open your safe just in case. This uses solid steel with a pry-resistant door. It also comes with a bolt down kit that keeps thieves from just picking this up to take it home with them. The interior is quite spacious, with a height of 8.7 inches, a width of 16.8 inches, and a depth of 11.6 inches. That’s enough to provide about a cubic foot of storage space. The floor in the interior is carpeted, and the shelf is removable. You can bolt this to a floor or a wall. It’s very spacious and it can work for valuables or for guns. It’s easy enough to install. Opening this isn’t really a big problem. It works to prevent petty theft. You have backup keys for your PIN lock. The carpeted floor protects your jewelry and wristwatches. There’s no special fire resistance. It’s not water-resistant either unless you place it high enough to prevent flood damage. A determined thief won’t take too long in destroying the kick mechanism to take the contents. Now, this 2087F model looks formidable, and you may notice that it uses a combination lock. This may seem old-fashioned, but at least you won’t need batteries. For backup, you get 2 extra keys so you can still open the lock when you forget the right combination to open it. 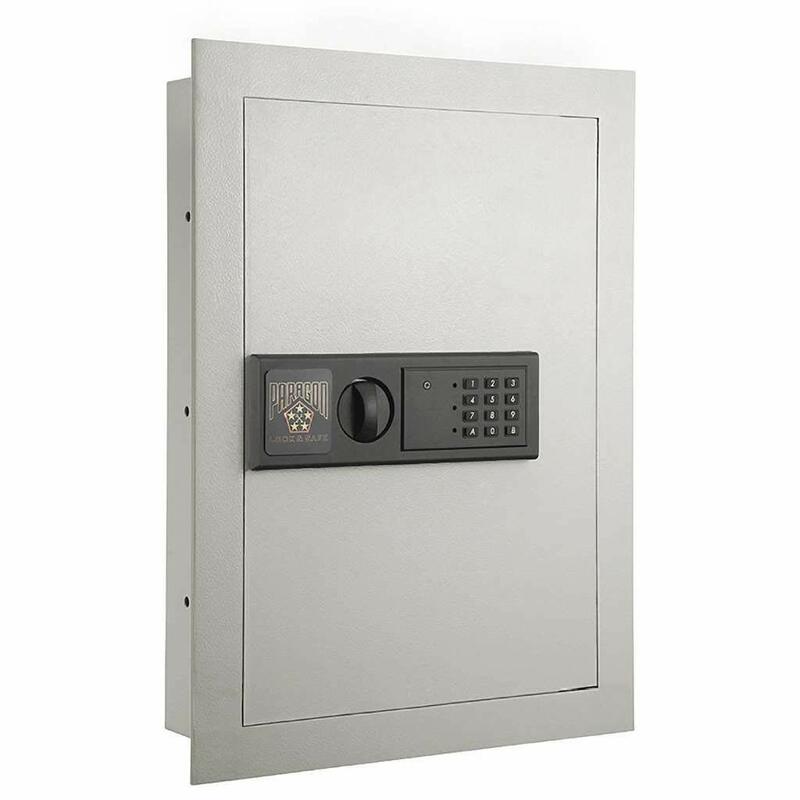 This safe is equipped with pry-proof concealed hinges and 4 to 5 locking door bolts with a combination lock. The safe is designed to prevent forcible break-in attempts. 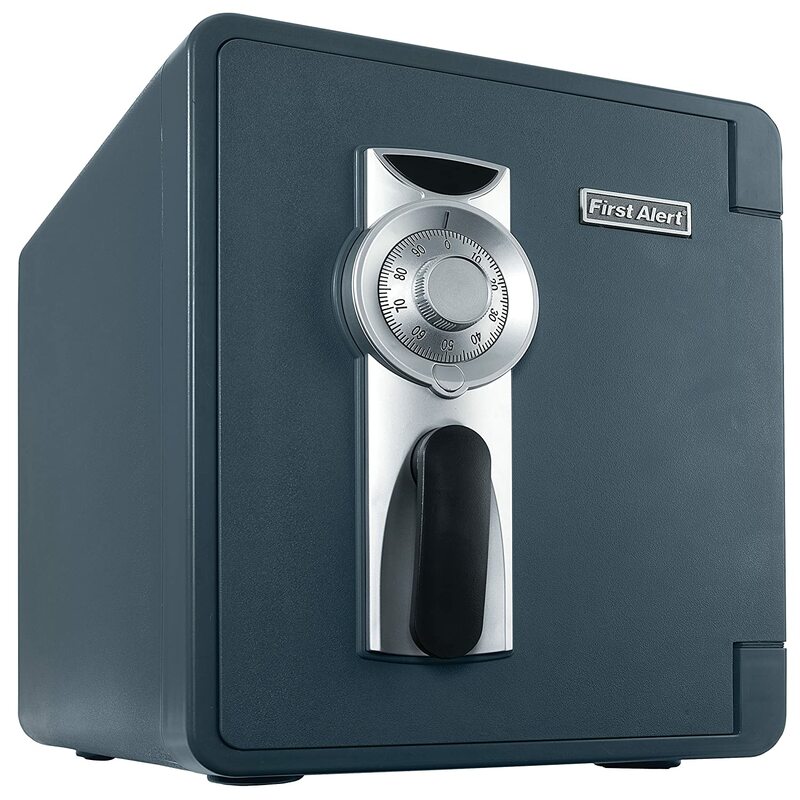 In a word, this is one of the best home safes at a reasonable price. This uses tough composite, with pry-proof hinges that keep thieves from using a crowbar to pry it open. This door locks securely in place, as it uses 4 live-locking door bolts. The inside measures 12.88 inches high, 10.38 inches wide, and 12.25 inches deep. That offers lots of storage space of up to 0.94 cubic feet. Inside, the storage shelf is adjustable, there’s a key rack, and a door pocket too. The composite material of the state is very fire-resistant, as it can last for an hour against temperatures of 1700 degrees F. During that time, the inside temperature doesn’t exceed 350 degrees F. An independent testing lab has also confirmed its ability to protect electronic media devices such as DVDs and external hard drives from fire damage. This is also waterproof so it’s able to protect both documents and electronic devices from flood damage. It doesn’t matter if the safe is fully submerged when it’s bolted to the floor, as the water simply won’t get in. If it’s not bolted to the floor, it will float so you can access it easily enough. Bolting this down is also extremely easy. It has theÂ Ready-Seal feature that lets you bolt this to the floor without the need to drill through the safe. There’s no need to use batteries for this, as it has a combination lock. It offers ample storage space and usable as a gun safe too. It can be used to protect documents and electronic media devices too. This can be bolted to the floor with no trouble. It’s fire-resistant enough to withstand high temperatures for at least an hour. The waterproofing keeps moisture out even when fully submerged. There’s an override key option. The shelf inside is adjustable. It’s a bit heavy at 82 pounds. There’s no carpeting for the interior floor. You first have to know what exactly you want to secure. Then you have to get the home safe that is large enough to contain these items. You may want to get features such as shelves and straps for various items so that the inside of the safe is nicely organized. The level of theft protection you get will depend on the actual value of the items you want to secure. If you’re securing expensive jewelry and wristwatches, then you will need tougher protection, such as resistance to tools such as crowbars. You may have to keep the safe in a secure place so that a thief can’t just pick up the entire safe and take it with them. However, you may opt for a more portable model instead if you want a safe that’s easier to take in your travels (or if you move around a lot). It’s also nice if the safe is a little bit harder to find when you install it, such as if it designed to be located behind a picture frame. You can also mount a safe on the wall or keep it under a bed. This is related to theft protection, but you also need to consider ease of use. How easy is it to open or lock? Are the locks reliable? In some cases, you have double locking mechanisms to make sure that you can still open the safe if a locking option becomes reliable. This is a crucial feature to look for if you’re protecting original documents, and you’re in an area that’s prone to flooding. Even plumbing disasters can lead to flooding as well. This is another feature that’s important to consider when you’re securing documents, as well as items such as USB sticks and DVDs because fire can damage these things. Even jewelry can get damaged by extreme heat. Your safe should offer some resistance in case your home catches fire. These are features that make the home safe better than your basic options. For example, the safe may have carpeted surfaces to protect items like DVDs and wristwatches. The safe may have installed lights so you can find what you need more easily in the dark. In other cases, you may hear a warning beep if you’ve failed to secure the door or the safe may automatically lockout if the wrong PIN code is used. Obviously, the safe should fit within your budget. It also makes sense to choose the more affordable model if you’re choosing between safes with similar features. It also doesn’t make sense to pay for a safe that’s much more expensive than the jewelry you want to secure. All these factors are considered when we came up with this list of viable home safe options. None of these safes are too expensive, and they get the job done. After reading the best home safe review you can just pick the right safe for the job, and you should rest easy knowing that your valuables are safer than just lying around in your closet or desk drawer. What home safe you should get depends greatly on what you wish to secure and the budget you’re working with. We reviewed the best home safes for your needs. 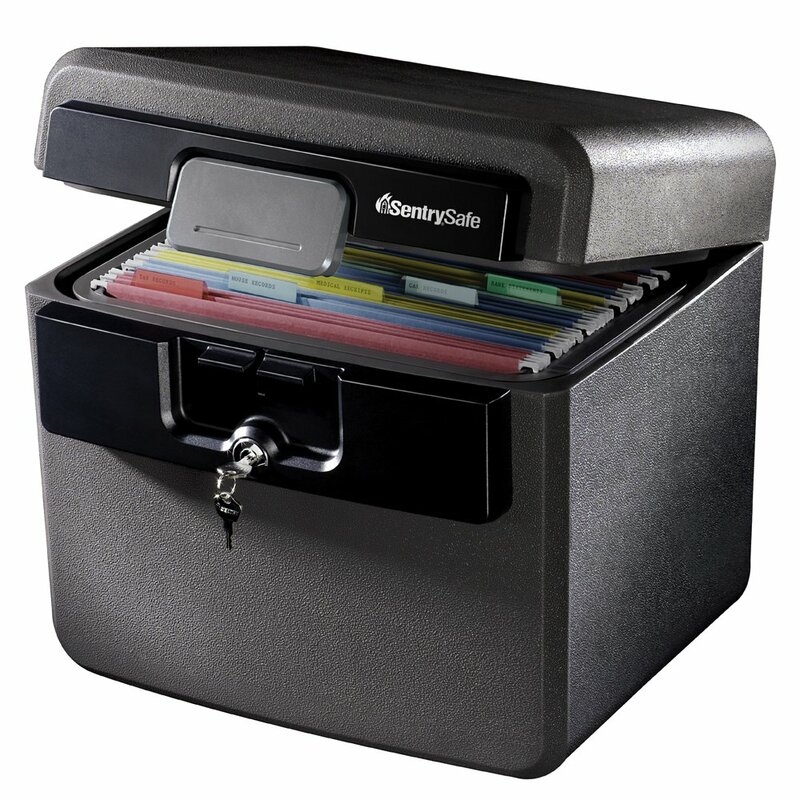 If you’re just worried about your documents and DVDs, then the Sentry Safe HD4100 is your best bet. It’s designed for precisely this use, and it is extremely affordable. If you do want something easy to open, then you can try the safes with the PIN lock as it should be no trouble for you to press the buttons to open the safe. Even if the battery runs out, the backup key makes things easier. The First Alert is a great home safe that can protect everything, from documents, electronic device, jewelry, and even guns. The point isn’t to forever keep thieves out, but to delay them long enough that they give up. This First Alert Home Safe does the job well, and its price is reasonable as well. To wrap up the best home safe analysis we can assure you that the other safes are also great as well and these products won’t disappoint you. Everyone has their own preference and they know what would be best for them. The top 5 picks are the most versatile safes for every people’s preference.